What is going on in your territory? What does your forecast look like this month? What are you seeing with regard to our competitors? Are there any service issues or problem client situations? I would completely bypass asking these questions of the inside sales team, customer service personnel or the service department. Why shouldn’t they be involved in these discussions? Your inside sales and customer service teams probably talk to your customers 20 times more than your outside sales team does. Why then do we not routinely solicit their input? It seems that most companies don’t think of them as part of the sales team. I was certainly guilty of this in the beginning of my sales management career. Bringing the entire team into the mix is a cultural change that is essential to truly pursue effective Team Selling. Sharing and leveraging all available critical business intelligence is required to gain and maintain that elusive competitive edge. Team Selling is simply the sharing and leveraging of knowledge within your company with everyone who touches the customer. 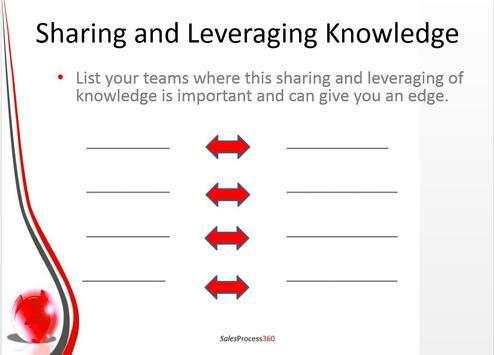 Have you put in place systems to easily foster the sharing and leveraging of knowledge within your company? Look at all the customer-facing touch points within your company and the communication of critical information between those touch points. Is it comprehensive, consistent and effective? This effort must start at the top and become part of the company culture, through and through. It needs to be part of the daily routine. Changing long-standing company culture can be daunting but it can be done with focus and strong management commitment. I was involved with a company that changed its culture to a true Team Selling approach and witnessed a huge payoff. The commitment to true Team Selling resulted in deeper penetration into each account with more of our products and services, which equated to upselling, cross-selling and significantly increased sales in an amazingly short timeframe. I am not going to tell you this was easy. It is the nature of outside salespeople to hold their cards close to the vest. Management must step in, lead by example and show the power of sharing and leveraging information. Start with a “teaming” approach with outside and inside salespeople pursuing specific customers together. This forces them to communicate on a daily basis. Also consider team bonus plans based on growth of accounts for which they are chained at the ankles. We set a baseline and rewarded teams for shared account growth. Everyone, including the company won. Outside and inside sales are the obvious areas to start with, but there are more team opportunities within your company. Fill in the form and review the systems, processes and procedures in place to provide easy documented communication between the teams. Management certainly has a treasure trove of history of accounts from their years of selling that can be shared or leveraged with the current outside sales team. The service team can and does get more information from the customer than the outside salesperson almost all the time. Make sure these two teams are communicating at all times. Put in place systems and processes too quickly and easily share and leverage information. Have service and outside sales meet on a regular basis to strategize on target accounts where the service person can help penetrate the account by sharing valuable inside customer information. Just like the daily news, communication doesn’t have to only be focused on the negative. Share and leverage positive information such as customer success stories and application/problem-solving successes. Take this information to other similar companies. Example: Your team solved a problem with ABC Company. Take that message to other ABC Company locations or other companies like ABC and apply the lessons learned. Remember: Sharing and leveraging information does not only have to be internal! The takeaway: Determine all the areas where your company can share and leverage information. Put in place systems, processes and procedures to facilitate a team-selling approach. Give your company yet another competitive edge.